Opus is a minimal note-taking application. It aims to be a mix between a text-editor and code-editor. It reads and writes .note files from your native file system. This means it works well with tools like Dropbox for syncing files across your devices. 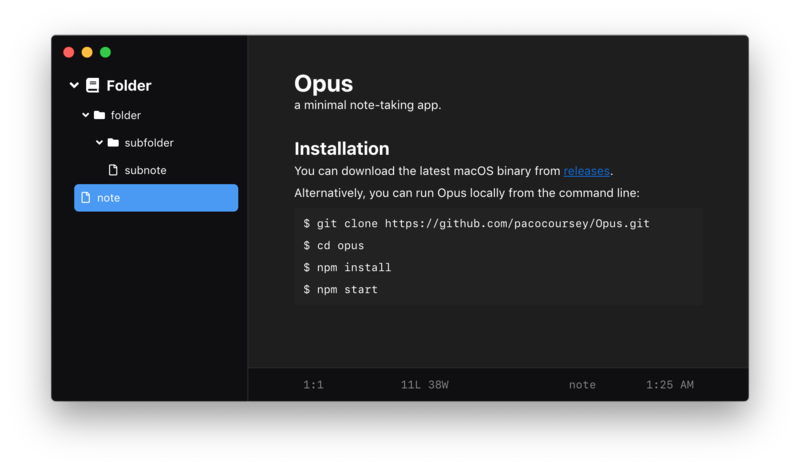 Much like a code-editor, Opus opens folders and allows you to edit the files inside. You can have multiple windows open, each with a different folder.  Editing: Supports rich text editing with all the features you&apos;d expect.  Uses Files: Uses tangible files in JSON format, not inaccessible databases.  Dark Mode: Includes a dark mode for late night writing. ⚙️ Customizable: The sidebar and footer can be hidden for a more focused experience.  Multiple Projects: Opus supports opening multiple folders at once. 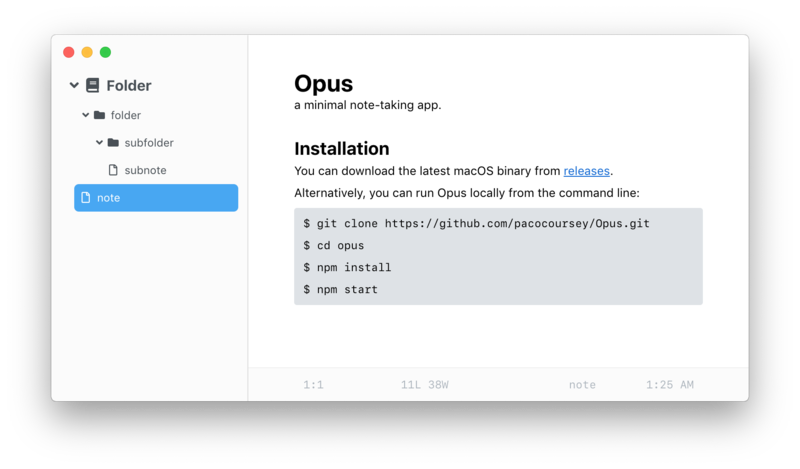 ✨ Simple: Opus has only the features you need. You can download the latest macOS binary from releases. Spellchecker, easily replace with suggestions via right-click. Window settings (position, size, dark mode, etc...) are remembered between sessions. Export notes to plain text, html, and markdown files. Automatically ask to update note contents if it is edited elsewhere. Document statistics shown in the footer (line count, word count, cursor position). Left: distractionless plain text writing application. Quill: The rich text editor that runs inside Opus.